When Jon and I were first married, I was still a vegetarian. Cooking something we both could eat was a major challenge. I wasn't happy just eating sides, he wasn't happy eating vegetarian meals all the time, and we both hated eating completely different meals, so I started to experiment with ways to make vegetarian versions of meat-meals. One of my favorite products for imitating non-vegetarian meals is MorningStar Farms Recipe Crumbles. In other words, fake ground meat. 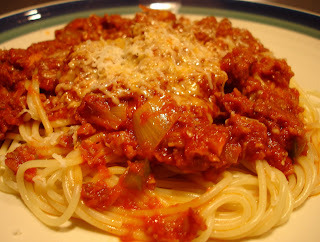 I used it as a ground meat substitute in everything - tacos, stuffed peppers and tomatoes, stroganoff, chili, and this dish, meat sauce over pasta. Even though I now eat meat, every now and then I like making the vegetarian versions of our meals. Add the fake ground meat and cook, stirring, for about 2 minutes; I also add some spices like oregano and red pepper flakes. Sometimes I add a touch of fresh Parmesan cheese. Once the meat is cooked (defrosted and warm), add sauce. You can use homemade tomato sauce or jarred. Since I haven't perfected homemade sauce yet, we used jarred. Jon's version is pretty much the same, but he cooks the meat almost all the way through before adding the onions, peppers, and garlic. He also lets his pot simmer just a bit longer. 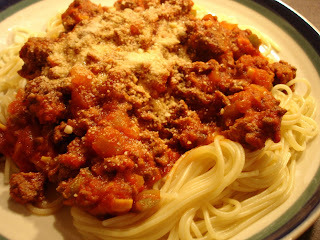 I love using the fake ground meat because has much less fat, takes in the flavors around it, and cooks so quickly. Give it a try, you might be pleasantly surprised!